Tip of the hat to Sam for this idea. Sweet! You can see the shape go through hyperbola, parabola, ellipse, then circle. The circle is easy. When k = 0, r is a constant 1. But it turns out that those are the degenerate forms. The real work is trying to prove that the form given creates hyperbolas when k > 1 and ellipses when 0 < k < 1. Luckily, the same method works for both. Given that in both the hyperbola and ellipse case, the center of the conic is at some (h, 0), we are looking to simplify our polar form into: x-h2+ay2=c. For the hyperbola, a will be negative; for the ellipse, a will be positive. The algebra gets a bit tricky, but the idea is simple enough. 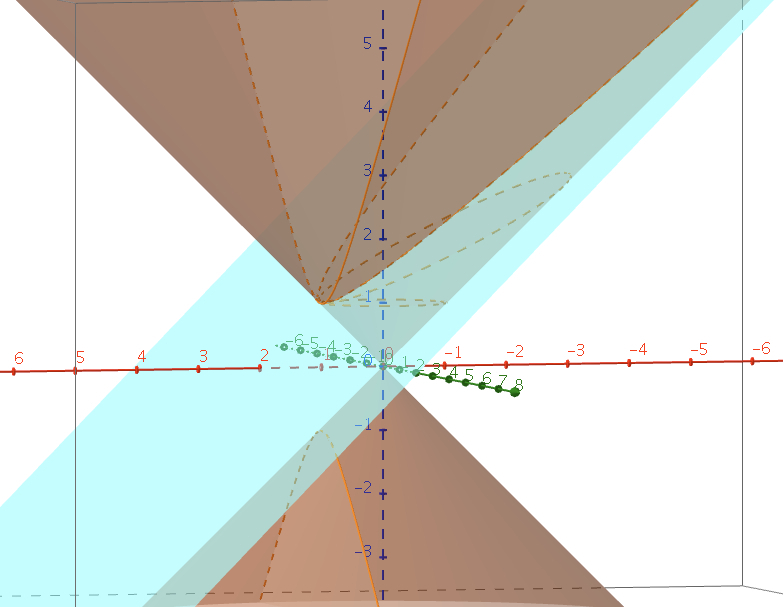 When k = 0, the plane is parallel to the cone's base. When k = 1, the plane is parallel to the side of the cone. When k is between 0 and 1, the plane is between parallel to the cone's base and parallel to cone's side. And when k is greater than 1, the plane is steeper than the cone's side. Thanks to Ian Rumsey for making the three-dimensional illustration; here is the GeoGebra file.